But in the Bible, a throw down was anything but friendly. A throw down was a call to cleanse the land and take back that which had been stolen. It is our call today to throw down (via intercession and declaration) that which challenges the righteousness of God. It’s Time for a Throw Down! And I said to the angel speaking to me, “What are these?” And he answered, “These are the horns that have scattered Judah, Israel, and Jerusalem.” Then the Lord showed me four craftsmen. And I said, “What are these coming to do?” And he said, “These are the horns that scattered Judah after which no one could raise his head; and these four craftsmen have come to terrify and throw down the horns of the nations who lifted up their horn against the land of Judah to scatter it” (Zech. 1:19-21). The horns in this verse represented the countries and leadership that opposed not only the Israelites, but ultimately the Lord. We are to “throw down” the “horns,” which represents those in leadership and other countries who are opposing President Trump in his efforts to cleanse our land—who are ultimately opposing a return to righteousness in our nation. 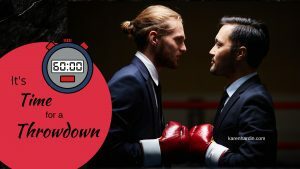 Where else are we called to “throw down”? And he lifted up his face toward the window and said, “Who is on my side? Who?” And two or three eunuchs looked down to him. He said, “Drop her down.” So they dropped her down and some of her blood splattered on the wall and on the horses. Then he trampled her (2 Kings 9:30-33). It is interesting that President Trump is like a modern-day Jehu in this hour. He is a spearhead to cleanse our land so revival can take place. “But I have a few things against you: You permit that woman Jezebel, who calls herself a prophetess, to teach and seduce My servants to commit sexual immorality and eat food sacrificed to idols” (Rev. 2:20). How does that happen? How do godly men and women fall to such deception? It is by seduction and tolerance of Jezebel. We, as the church, have tolerated this blight on our land. Some denominations, churches and pastors are now changing their entire theological structure to embrace one or both of these actions that the Lord has clearly spoken are to be “thrown down” and not accepted! If you are reading this, and you have a heart to pray and be a watchman on the wall, then will you join with me today not only to call this down in prayer, but also speak out to those around you to join this battle and throw down that which is being established as law in our nation? It’s Time for a Throw Down. And, I ask you, as Jehu once did—who is on our side? Who? 1. Abortion and sexual immorality, we throw you down from your high place, we repent and we declare the righteousness of God to be established! 2. We say to that mountain of “social justice and equality” rather than true justice, “Grace, grace” that these blights will come down and become a plain before our eyes. We declare that we are taking back our land and call forth the glory of God to be revealed. “Who are you, O great mountain? Before Zerubbabel you will be made level ground, and he will bring out the top stone amidst shouting of ‘Grace! Grace to the stone! '” (Zech. 4:7). 3. We pray off the blinders and deception that has come into the church and upon church leaders who have been seduced and now embrace sin and call it “normal.” We pray that the Holy Spirit will guide them into all truth. “But when the Spirit of truth comes, He will guide you into all truth. For He will not speak on His own authority. But He will speak whatever He hears, and He will tell you things that are to come” (John 16:13). 4. We declare that President Trump is unimpeachable, and that this ungodly attack to remove him from office and stop the cleansing of our land will not succeed. Instead we call repentance, cleansing and revival to come forth!